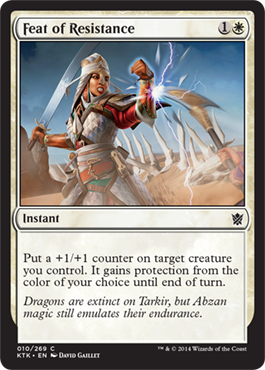 Probably timed to coincide with the start of the Community Cup, the full spoiler for Khans of Tarkir has been released. The timing is also convenient for me, since it allows me to immediately announce the results of the contest I held right here at Write Adept in my previous blog post. For reference, I should have numbered them, particularly since they ended up out of any logical order due to my unusual copy/paste from the site. For today's post, I will simply refer to them from left to right, finishing the whole row before moving down to the next row. 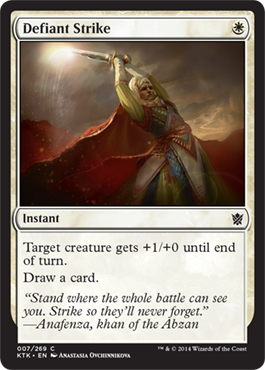 The correct rarity for the cards is as follows: Uncommon, Common, Uncommon, Common, Common, Rare, Uncommon, Common, Common, Common, Common, Common. 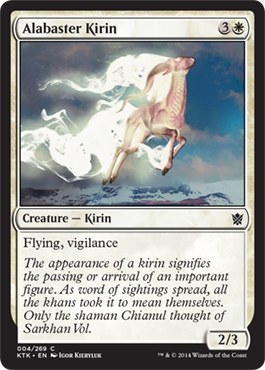 Out of these eleven cards, I thought six of them were obviously Common: Alabaster Kirin, Feat of Resistance, Firehoof Calvary, Defiant Strike, Erase, and Jeskai Student. 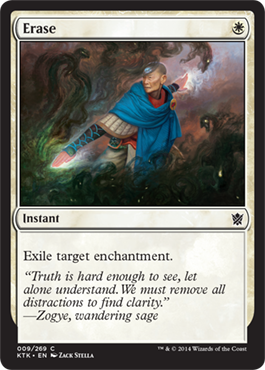 These six cards represent elements almost always found at White at Common: simple combat tricks, "fair" costed creatures with a single ability, a single-target protection spell, and a reprinted Enchantment hate. 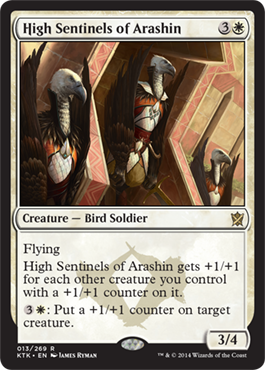 Additionally, both Brave the Sands and High Sentinels of Arashin were clearly not Commons, since both add significant complexity to combat with the latter also requiring you to keep an accurate understanding of the board to determine the Sentinel's Power and Toughness. 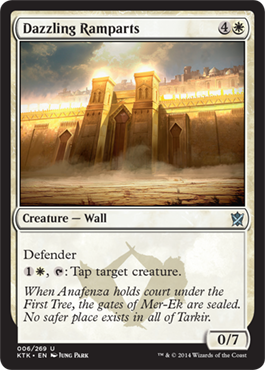 That left Abzan Falconer, Dazzling Ramparts, and Kill Shot as the more tricky to evaluate. Under the right circumstances, I would vouch that all three could be potential Commons, at least with minor tweaks. 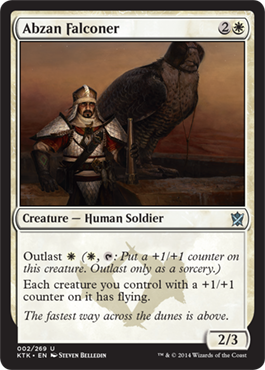 Abzan Falconer is probably too efficiently costed to be a Common, both for its Outlast cost and its casting cost, and granting Flying is arguably too strong at Common. 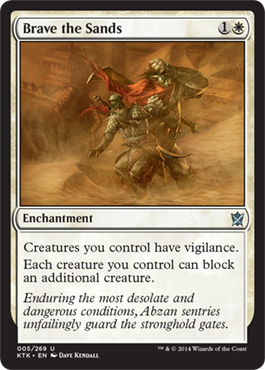 However, it isn't that different than Ainok Bond-Kin, and so is borderline between Common and Uncommon. 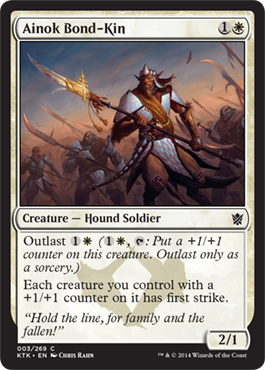 Dazzling Ramparts is even closer, as White often gets a tapper at Common, and an 0/7 Defender for 1W is not particularly efficient. 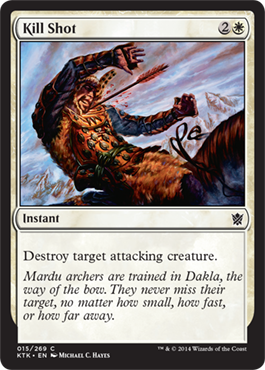 Finally, Kill Shot, while clearly better than the classic Divine Verdict, is a functional reprint of Rebuke from Innistrad. 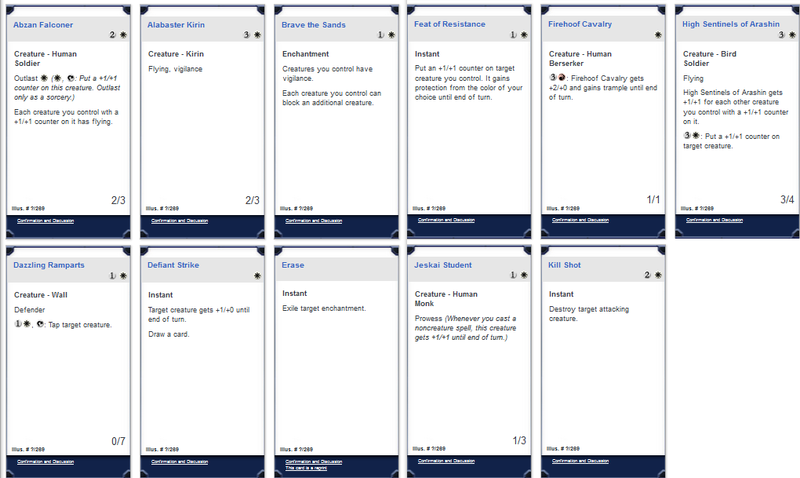 As far as my evaluation, I actually missed only one, placing Dazzling Ramparts as a Common instead of an Uncommon. Chris Baker, one of only two entries, got them all correct, and so Writer Adept will be awarding him a single ticket for his victory! I hope you enjoyed this exercise. Thanks for reading.